UNITED NATIONS, October 20 -- As the UN in Sudan warns of rebel and government troops massing in Darfur, and in the South airlifts an opposition figure's fighters from his stronghold to Juba, its Mission faces other troubles as well. The UN's envoy Rodolphe Adada has not yet been replaced. Interviews, Inner City Press is told, will take place the first week in November. 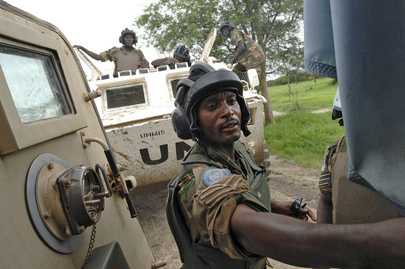 These sources say that the future of Nigeria's peacekeepers in Darfur is not certain. Nigerian Martin Luther Agwai is no longer the UN's Force Commander -- although he's still on the UN payroll -- and U.S. President Barack Obama's decision to visit Ghana and not Nigeria makes the latter less willing to help, including in Darfur. As the U.S. announces a new strategy of carrots, other pieces are not falling into place. At the UN's noon briefing on Tuesday, Inner City Press asked about the troops massing in Darfur, and the UN Mission in South Sudan's airlift of the fighters of Paulino Matip to Juba. Deputy Spokesperson Marie Okabe said didn't have an information about either. Inner City Press asked how that could be. Later in the briefing, a staffer came in and handed Ms. Okabe a sheet of paper. She read out a statement about the UN's concern about troops massing in Darfur. On South Sudan, nothing. Khartoum sees the SPLA's "harassment" of Matip's fighters as an abuse, now abetted by the UN, both Peacekeeping and Political Affairs. Of the two, they prefer the former. They have particular scorn for the DPA official currently "preparing the ground" in Guinea for a board of inquiry, essentially ordered up by Bernard Kouchner of France, they say. They marvel at how the possible referring of the Goldstone report on Gaza can be kept away from even a vote on referral to the International Criminal Court, while their case got referred. The House of Double Standard, they call the UN. There's double dipping, too. But more on that anon. Watch this site. UNITED NATIONS, October 20 -- For the second round of Afghan elections now slated for November 7, UN Secretary General Ban Ki-moon favors keeping open what were described as "phantom" polling stations by the deputy envoy who Ban fired, Peter Galbraith. 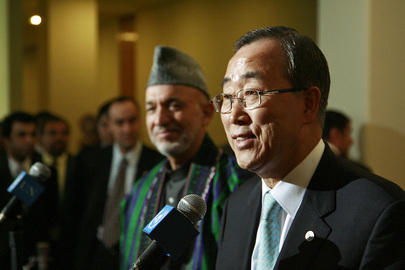 Shortly after Hamid Karzai announced he would accept the second round based on findings of widespread fraud in the first, Ban spoke with the Press outside the UN Security Council chamber in New York. Inner City Press asked him, "What about the phantom polling stations?" Galbraith said that polling stations in areas entirely under the control of the Taliban, where no verification would be possible, should not be open in the first round. Inner City Press asked Mr. Ban if he thinks these "so-called phantom polling stations" should be open in the second round. Ban, after repeating the phrase, said "I'd like to make it clear... the purpose of the UN is assisting the electoral process last time" was to "ensure all Afghanistan people would be able to express their will by casting votes." "The idea suggested by Mister Peter Galbraith to reduce the number of polling stations" just to avoid fraud was "not acceptable [under] the core values of democracy," Ban said. Ban then argued this was why he fired Galbraith, "not about fraud," but on the principle of enfranchisement. While many correspondents after Ban's stake out interview expressed skepticism at this, noting that Galbraith was only fired when he publicly called into question the partiality of Ban's top envoy Kai Eide and thus of Ban himself, at a minimum Ban's statement might be interpreted as, going public with a call to limit the number of polling stations was "not acceptable." Reasonable minds can disagree about whether polling stations that cannot be effectively monitored help or hurt democracy. Therefore to argue that any questioning of such stations is "not acceptable under the core values of democracy" might seem hyperbolic, or an attempt to spin what some see as another of the UN's firing of whistleblowers or critics. As possible deals between Karzai and Abdullah Abdullah will be rumored to cancel the November 7 run-off, there is sure to be a debate about, among other things, the wisdom of the so called phantom polling stations. Watch this site. UNITED NATIONS, October 13 -- In the wake of the UN's contested role in the fraud ridden election in Afghanistan, the Security Council on Tuesday met about the elections slated for November 29 in Cote d'Ivoire, where the UN has some 7000 troops. While Ivorian President Laurent Gbagbo has dodged elections for some time, now he has been quoted that they're on. Inner City Press asked the UN's top envoy to Cote d'Ivoire, Choi Young-Jin, about local reports that the registrations from some 213 registration stations have not been processed, eliminating eight percent of eligible voters. Video here, from Minute 4:32. "blames what it called 'the scandal surrounding the voter registration' on the bodies that conducted the operation, namely, the National Statistics Institute and SAGEM (a French company), saying that they have botched up the work. The paper further revealed that the data which had been collected in some 213 registration centers were not processed, representing 8 percent of the total data that were not taken into account on the provisional voters' lists." Even beyond this eight percent, Mr. Choi acknowledges that 40% of the registrations have not been verified against historical records. He said he has a solution in mind, but wouldn't share it with the Press, but rather return to Cote d'Ivoire and play his "cards urgently and intelligently." He mentioned using mobile phone records. Inner City Press asked him if he could distinguish the UN's role in Afghanistan, where envoy Kai Eide is being called biases for incumbent Hamid Karzai. Mr. Choi answered, "I need my colleague in Afghanistan to answer you question." That would be... Kai Eide. One wag asked, but where is Mr. Choi's Peter Galbraith? 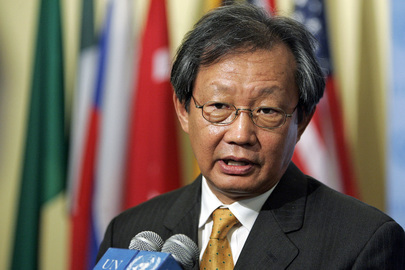 When the Security Council President for the month, Vietnam's Ambassador Le Luong Mihn, came to the stakeout, Inner City Press asked him if there was any thinking to ensure that the UN's situation in the election in Afghanistan is not repeated in Cote d'Ivoire. "Today was on Cote d'Ivoire," he said. Video here, from Minute 2:53. Inner City Press tried again, asking if there was any analogy. "We did not discuss Afghanistan today," he insisted. But maybe they should have. Footnote: Inner City Press also asked Mr. Choi if he or the UN had played any role in the settlement between Cote d'Ivoire and Trafigura about the toxic waste dumping. No, Mr. Choi said, that is a bilateral problem between Cote d'Ivoire and the company. A narrow mandate: but could it still blow up, a la Afghanistan? Mr. Choi said keep up the momentum. Watch this site. 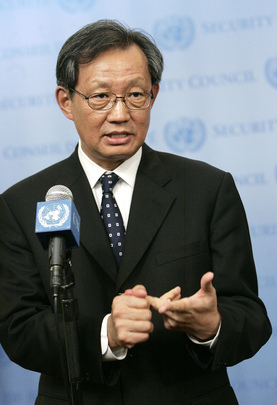 UNITED NATIONS, July 23 -- The UN's envoy to Cote d'Ivoire Choi Young-jin told the Press on Thursday that the contester voter registration process in the run up to long promised Presidential elections was "credible," and that there is no need to draw down UN peacekeeping troops in the country at this time. Local sources say that up to 20% of those who should have been registered to vote, weren't. Meanwhile when Inner City Press asked Cote d'Ivoire's representative at the UN on Thursday if his country needs troops or peacekeepers, he said "no." An advisor to President Gbagbo told Inner City Press that the UN is spending over $400 million a year for reporting on crime, but will remain in the country "going to the beach" because that's how the UN works. Another way the UN works in Cote d'Ivoire is to stay quiet. Inner City Press asked Mr. Choi if his office had any involvement in inquiring into the disappearance of journalist Guy Andre Kieffer, which an Army major recently blamed on those around the President's wife Simone Gbagbo. That is a bilateral matter, Mr. Choi twice said, declining to answer further. Video here, from Minute 9:29. Later Mr. Choi made a sales pitch for his mission, saying it could become the most successful of all of the UN's 18 mission because Cote d'Ivoire has a budget of $5 billion a year, and 40,000 soldiers and police, all paid by the government. Inner City Press asked him, in light of the litany of negative reviews this month of Secretary General Ban Ki-moon's first two and a half years, if he had any defense to offer, or if he thought his Mission was not praised enough by the press. Choi largely avoided the questions, other than saying he is loyal to the Secretariat. That may have done without saying -- or, compared with the behavior and refusal to file financial disclosure and otherwise obey of certain other UN envoys, perhaps not. Watch this site. Footnote: while Inner City Press didn't ask it this time, there has still been no reporting by Choi or the UN on what discipline, if any, was meted out to the Moroccan peacekeepers repatriated from Cote d'Ivoire in the face of accusation of sexual exploitation and abuse. A report should be given. Uganda Won't Implement ICC Warrant on Bashir Until "Verified" by AU, Can Kony Copy? UNITED NATIONS, July 22 -- Uganda's foreign minister Sam Kutesa told the Press on Wednesday that his country is "obligated to implement International Criminal Court warrants" such as the one against Sudanese president Omar al-Bashir, but that as a member of the African Union, Uganda is not implementing the al Bashir warrant until the AU "verifies" it. Video here, from Minute 1:24. While some might welcome a process for regional appeals of ICC indictments, it raises the question: why for example can't Lord's Resistance Army leader Joseph Kony, who Uganda referred to the ICC, forestall execution of the ICC warrant against him by commissioning a study such as the one of Bashir? That is, how prominent does the study group have to be, to justify an ICC member not acting on an ICC indictment? On July 17, Inner City Press asked the President of the ICC's Assembly of State Parties, Liechtenstein's Ambassador Christian Weneweser, about Uganda's positions on al-Bashir. Some in the administration of President Yoweri Museveni had said Bashir would be arrested if he came to Uganda, then Museveni said no and reportedly apologized. Wenewaeer said that on July 16, he had a long conversation with Uganda's Ambassador who gave assurances was committed "to its obligations under the Rome Statute" -- that is, to arrest al Bashir. Since Museveni had invited al Bashir to Uganda, Inner City Press asked Wenaweser if this might be a set up. "Ask him the question," Wenaweser said, referring to Uganda's Ambassador Ruhakana Rugunda. Video here, from Minute 6:42. 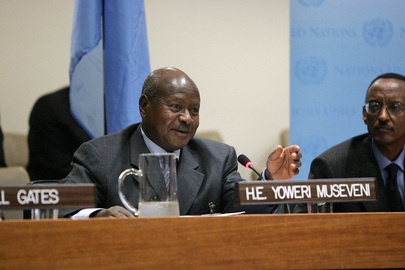 While Inner City Press later that day did ask Uganda's Ambassador the question -- click here for the answer -- on July 22 his boss, foreign minister Kutesa, was at the UN to debate post-conflict peacebuilding. Afterwards Inner City Press asked him to clarify Uganda's position. "Uganda's position is very clear," he said, adding it is obligated to implement ICC warrants but as a member of the AU it will await the findings of the AU group headed by South African's former president Thabo Mbeki. Then you will implement the warrant? Absolutely, Kutesa said, once the AU has verified the indictment. And if it is not verified, Inner City Press asked, then what? 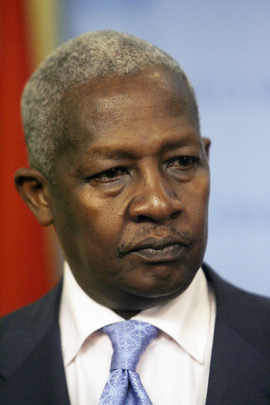 "Then the AU will take a position," Kutesa said. So apparently, the African Union trumps the ICC, at least for Uganda. Watch this space. Footnote: Minister Kutesa held a lunch for ambassador at which, one attendee told Inner City Press, he spoke in more detail about Somalia that at the Council stakeout. There, when Inner City Press asked about peacebuilding and the DRC and Somalia, he answered vaguely that both are ready for peacebuilding. Since al Shabaab is throwing at least parts of the UN out of Somalia, its readiness for the PBC is in question. Kutesa appeared with the suddenly omnipresent Chilean Ambassador Geraldo Munoz, chairman of the Peacebuilding Commission, head of the investigation of the murder of Benazir Bhutto in Pakistan, and speaker for pro Responsibiliy to Protect NGOs now at the UN. Some say Munoz is looking for a UN job. Watch this space. UNITED NATIONS, July 16 -- Uganda is a state party to the International Criminal Court, and a member of the African Union. These two roles came into conflict this week, when Uganda officials were quoted that if he visited Uganda for a summit, Sudanese President Omar al-Bashir would be arrested on the ICC warrant against him. Then it was reported that Ugandan President Yoweri Museveni, who referred Ugandan rebel Joseph Kony of the Lord's Resistance Army to the ICC, called al-Bashir to assure him that Uganda would not enforce the ICC warrant. On July 17, Inner City Press asked the President of the Assembly of State Parties of the ICC and its Rome Statute, Liechtenstein Ambassador Christian Wenaweser about Uganda's double message. Wenaweser said that on July 16, he had a long conversation with Uganda's Ambassador who gave assurances was committed "to its obligations under the Rome Statute" -- that is, to arrest al Bashir. Since Museveni had invited al Bashir to Uganda, Inner City Press asked Wenaweser if this might be a set up. "Ask him the question," Wenaweser said, referring to Uganda's Ambassador Ruhakana Rugunda. Video here, from Minute 6:42. As luck would have it, Ambassador Rugunda, July's president of the Security Council, came to the stakeout an hour after the ICC Justice Day briefing. Inner City Press asked Ambassador Rugunda to respond to Wenaweser's characterization of their conversation and his alleged commitment to live up to Uganda's Rome Statute obligations to arrest. Ruganda noted that the African Union has set up a committee of former heads of state, led by South African Thabo Mbeki, and said that Uganda is waiting for a report from Mr. Mbeki. Ruganda said this should make his country's position clear. Inner City Press asked, so if al Bashir visits, he will not be arrested? Ruganda said his country has invited al Bashir and is a "respectable state" -- they did not invited al-Bashir to Uganda in order to arrest him. Video here, from Minute 1:26. Wenaweser also bragged that al-Bashir, since he was indicted by the ICC, has not visited any state party, leading some to believe that there is a method to the confusion in the run-up to al-Bashir's scheduled trip to Uganda, which got canceled. Also, a day after Ban Ki-moon's spokesperson was asked but did not answer if chief UN peacekeeper Alain Le Roy met with al-Bashir during his recent trip to Sudan, Inner City Press asked Le Roy if he had met with al Bashir. He was out of the country, Le Roy answered, "in Egypt" at the meeting of the Non-Aligned Movement. But would Le Roy have met with al-Bashir? He shrugged at the hypothetical question. 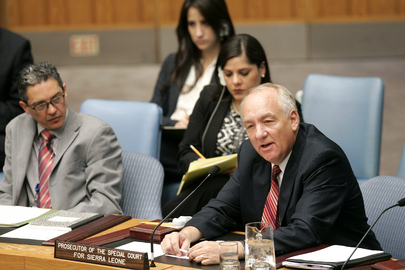 UNITED NATIONS, July 16 -- Already nominated to become President Obama's Ambassador at Large for War Crimes, Iowan Stephen Rapp came to the UN on July 16 to cautiously discuss the Charles Taylor trial ongoing at the Special Court for Sierra Leone in The Hague. In a nine-minute stakeout interview which only Inner City Press attended -- call it an exclusive -- Rapp and the Court's President Renate Winter took five questions and answer three and a half. Video here. Inner City Press asked about the 227 witnesses that Taylor has called for his defense. Will the prosecution be trying to whittle the list down? Renate Winter said that will be up to the presiding judge. Rapp noted that in the case of the interim leader of the RUF, the defense named 330 possible witnesses and ended up calling 59. Inner City Press asked about the missing and perhaps dead indictee Johnny Paul Koroma. Rapp said that either an internationalized court could be set up within the judicial system of Sierra Leone -- but then amnesty might apply -- or that the case could be transferred to other countries which would have jurisdiction. He said that discussion have begun with two such countries, which he would not name. Since the recent press coverage of the trial has revolved around the skulls Taylor acknowledges authorizing his forces to display at roadblocks, Inner City Press asked what probative value if any this might have, and if Rapp thinks the media is focused on the wrong things at the trial. Rapp said he will not comment on anything under judicial consideration, but that skulls could constitute a "gruesome display of human remains" and have some probative value. As it has asked Ban Ki-moon's spokesperson, the UN envoy to West African Said Djinnet and Congo envoy Alan Doss, Inner City Press asked Rapp to comment on the Liberian Truth and Reconciliation Commission's recommendation that President Ellen Johnson Sirleaf be barred from public life for thirty years, in part for providing financial support to Charles Taylor. Rapp said "what happened in Liberia... is up to Liberians," and noted that Liberia's parliament must consider the TRC's recommendations. Now that Rapp has been nominated for his new U.S. job, Inner City Press asked Renate Winter what provisions are being made to replace him. She said there will not be a day with out a prosecutor. Rapp added that if he is confirmed by the U.S. Senate, he will begin arranging for a transition, seeing how much notice he should provide. Rapp is a lawyer's lawyer, but whether his soft spoken style is best suited for the Obama Administration's Ambassador at Large for War Crimes, as the Administration considers joining the International Criminal Court, remains to be seen. The fact that only one reporter waited to question him even after the nomination speaks either to lameness within the UN press corps, or to a perceived lack of news value. Rapp knows the system, and could well advise a more public face of the fight against impunity. We'll see. On the morning of June 5, Inner City Press obtained the draft resolution that, as a must-credit exclusive, it puts online here. Watch this site.